How does a small business beat the recession? Outsource!!! The recession seems to be a big topic among small business owners and entrepreneurs. Big corporations seem to have no problem getting the financial assistance they need but what happens to the small business owner. In 2006, according to the Office of Advocacy, there were 6 million firms with employees and in 2007; there were 21.7 million without employees. If small business owners make up the majority, why isn’t there a solution for them? Who’s helping them beat the recession? How do they create profit and grow their businesses in this ever changing economy? In a typical day, there are more tasks than your average small business owner or entrepreneur can realistically do in an eight hour work day: marketing, bookkeeping, e-mails, phone calls, data entry, customer service, the list goes on and on. This list is in addition to the business owner going out and trying to create new revenue. How do you maintain your current client base and build? Many small business owners can’t afford to hire employees to take over the day to day tasks, much less provide office space, training and equipment for them. 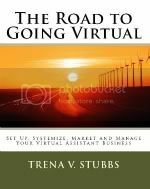 Entrepreneur Trena Stubbs, founder of Apex Bizness Solutions has a solution: Virtual Support. Virtual support allows companies to have the support of a team without the associated costs. These tasks include just about anything that can be done via telephone, fax or the Internet, such as handling correspondences, bookkeeping, scheduling, database management, copywriting and Web/graphic design etc. Apex Bizness Solutions is located at 289 Jonesboro Rd Ste 307, McDonough, Georgia 30253. At Apex, we make the outsourcing process easy for our clients. Our team of specialist can assist you in every area of your business, we believe in keeping it simple. One Company, One Invoice, One Goal is our slogan and we stand behind it 100%. Contact us today for a free, no obligation, consultation.